Now that the legislative session is ending for the summer I am looking forward to being back in the community to meet with constituents. 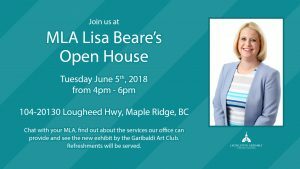 Help me kick off the summer by coming to our next open house on Tuesday, June 5th from 4pm to 6pm. Please come by to chat, find out about the services our office can provide and see the new exhibit by the Garibaldi Art Club. Refreshments will be served.